ARRI continues to broaden their LED line and reaffirm their commitment to accurate color rendering with the introduction of the SkyPanel S60-C LED Softlight. Supported by a steel yoke, the panel surface area measures 25.4 x 11.8" and employs interchangeable thermoplastic diffusers that range from Lite to Heavy to soften the light and wrap its output around your subject. 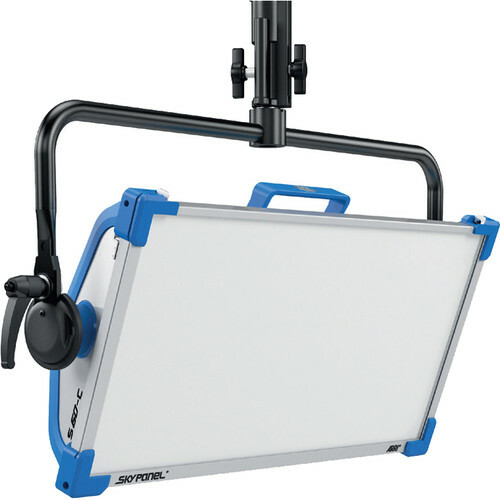 The SkyPort outputs the equivalent of a 2000W tungsten soft light while drawing a maximum of only 450W. Using technology originally designed for the L7-C Fresnel, the SkyPanel S60-C can be adjusted to output a warm 2800K to icy blue 10,000K light and also uses the full RGB+W color gamut with hue and saturation control for fine adjustments. Full Minusgreen to Full Plusgreen is also possible, so if you're lighting for blue or greenscreen, you can simply dial in your chosen color. This wide degree of control is responsible for a high CRI of 95 and a rating of 90 with the newer TLCI standard. All of these functions as well as 0-100% dimming can be adjusted locally with the SkyPanel's onboard controller or remotely via DMX or a LAN. Besides inputs and outputs appropriate to these functions, the light also has a USB-A port for downloading firmware upgrades from a thumb drive or any PC/Mac. The SkyPanel S60-C can be used worldwide thanks to its included 90-250 VAC power supply, but it can also use optional 23-36 VDC batteries when mains power is unavailable. Besides the power supply, the light comes with a Junior (1 1/8") pin and a standard diffuser. This version of the light has a manual yoke and comes with an Edison power cord. Box Dimensions (LxWxH) 23.3 x 18.2 x 11.9"
SkyPanel S60-C LED Softlight with Manual Yoke (Blue/Silver, Edison) is rated 5.0 out of 5 by 5. Rated 5 out of 5 by Tamel from Best out there Awesome product, as is always the case with Arri. Seems like whatever they release, it becomes the industry standard. SkyPanels are no different. Get the remote. Rated 5 out of 5 by Al from ARRI perfection The best RGB panel on the market period. If you are hesitating - buy it!! Rated 5 out of 5 by Anonymous from ARRI SkyPanel S60-C LED Softlight This is the best light ever my friend who work for ARRI let me use for a day. i used for photo shoot and the picture were great. Rated 5 out of 5 by maurifrm from Amazing Light! This light is very bright and soft, the construction is very strong, and Very high quality! Rated 5 out of 5 by Carlos Mauricio from Amazing Light!! This light is very bright and soft, the construction is very strong, and Very high quality! Is this a brand new S60, or is this refurbished? This item would be brand new in the box. Does it include a tripod as a stand? The Arri S60 does not include a stand. Can I use 5 feet away from subject for interviews or is the fan too loud? There is some noise, and at 5 ft. away the sound recordist may complain on an interior (minimal), but definitely not on an exterior. I've never had anyone complain. What is the equivalent in tungsten or hmi? The light is considered brighter than a 2k tungsten softlight or a 6 k tungsten space light.The full data sheet on its output can be seen on this link, http://bit.ly/1NlvCus. What is the minimum and maximum wattage consumption of the Arri SkyPanel S60-C LED Softlight? The maximum wattage consumption of the S60-C is 400 Watts. The product images are identical for the Bare Ends / Pole Operated and Edison / Yoke Mount . What is the exact mounting terminator for each of the two specifications? Are there any other differences than the terminator. As much detail as possible on this would be extremely helpful. The Pole Operated version is for use in studios where adjustment of tilt and pan is done with a pole from the ground. This model comes with a bare ends cord which means there is no power connector at the end of the power cord and customer must supply their own. The Pole Operated yoke has a 28mm (Junior) pin.The standard mount is a regular yoke with a high strength tilt lock and a 28mm (Junior) pin. The Edison refers to the standard American type connector on the power cord. does the price include PSU? Yes, the SkyPanel comes with the PSU, DC cable, powerCON Cable, and Standard Diffusion.